400 + Selected Toppers of 10th & 12th were invited today with their Parents for Motivational Seminar UNMESH 2019 at newly constructed Modi Sabhagrah, Wisdom City, Jhunjhunu on January 12, 2019. Dr Dilip Modi, Hon'ble Chairman JIVEM Education, infuse the words of inspirations to the students. ‘I Will’ was the subject of the seminar in which Dr Modi shared the full proof success mantra with the students and ask them to set a target not below than 100 percent for board examinations. He said that in order to stand high in examinations every student must worry for every one-fourth mark and should do hard efforts to score 100 out of 100 in every subject. By giving the example of Marble Stone slabs and a God’s statue, Dr Modi asked the students to choose their path of life, whether they just want to remain a stone like marble or they want to be like God’s statue and get honored. Illustrating the flying kite, Dr Modi touched the emotional quotient of the parents and advised the parents to keep the due vigil over their wards. Dr Modi asked the parents to provide a conducive environment of studies to their wards and keep a parental watch over the students with a positive mind set. It is worth mentioning that the researches, understandings, experience and devotion of Dr Modi in the field of education, have helped thousands of students to pave their path of success In 4 hours marathon seminar Dr Modi presented the blue print of success for board examinations. Overall, it was a wonderful session for the students and parents. 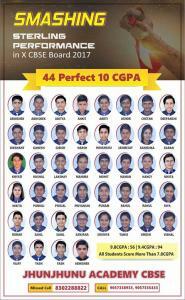 As many as 44 students of class X scored perfect 10 CGPA in X Result 2017. Dr Ravi S Sharma, Principal stated that school has registered the maximum no. of Perfect 10 CGPA in the region. Mohit Dangi, Rahul Saini, Abhishek, Harsh, Tanvi Yadav, Pankaj Kumar, Himanshu, Saumya Kanwar, Sahil Choudhary, Ganesh Agarwal, Riya Dhankhar, Deekshant Singh, Khyati Ranasaria, Priyanshi Sihag, Vijay Kumar, Ronak Sharma, Poojal, Chetan, Umesh Kumar, Poonam Kanwar, Janmejay Ahlawat, Lakshya Choudhary, Arti Gupta, Mahima Choudhary, Vishal, Ashok Kumar, Naman Kaswan, Karan Goenka, Girish Katewa, Abhishek Hiranwal, Kushal Jangir, Ankit, Nancy Sharma, Sahil Saharan, Rahul Yadav, Abhishek, Aditya Roy Dadarwal, Nikita Chahar, Nikita Godara, Sanjna Kumari, Deepanshi Basera, Kanishka Dhupia, Yash Jangir and Yash Ranasaria outshines in the result with perfect 10 CGPA. Dr Sharma further iterated that 56 students of school score 9.8 CGPA, 94 students score 9.0 CGPA and no student score below 7.0 CGPA. It is a historic result, says Principal. Dr Dilip Modi, Chairman, Mrs Nirja Modi, M.D., Mr Ashutosh Modi, Ms Ranu Modi, Mr Akash Modi and Garima Modi congratulated the students, parents and the teachers for this outstanding result. The achievers attributed their success to the incomparable academic environment of school, expert guidance of teachers and blessings of their parents. A wonderful felicitation ceremony was organized in wisdom city campus on this historic result. Mr K R Dhinwa, Hostel Superintendent, Ms Saroj Singh, H.M., Mr Rohitash Poonia, Administrator were also present in the ceremony. 600+ selected Toppers of class X, XII and GyanKuteer Coaching and a huge range of learning facilitators of JIVEM Education overvalued the Jhunjhunu Academy Guashala Road campus on 03 September, 2017on the occasion of Pre-Unmesh 2017-18. Dr Dilip Modi, Chairman, JIVEM was the Key-Speaker to this wonderful event which was held to motivate the toppers of JIVEM Education. The main topic of the Seminar was “Change From Within” with a purpose to inspire the students for their upcoming board examination. In his ever hypnotic style, Dr Modi verbalized the difference between Promotion and Selection. He said that with 33% any one can be promoted to the next class but for selection in any competition, he/she must be among the toppers. He presented a complete action plan and a blue print for achieving desired target. Through some compelling examples, he explained the importance of Goal Setting and the perfect ways to hit the target. He gave a clarion call to the students to keep their burning desire alive and always strive to put every hard effort in order to score 90+ in their exams. Adding an emotional quotient to his seminar he asked the students to pay due regards to their parents by performing extra-ordinarily in Board Exams. He illustrated several inspirational videos and stories to elaborate the importance of toil and moil. In a 4 Hrs Marathon Seminar, Dr Modi spoke on development of Concentration, Sitting Power and Memory. With the help of Ramdhari Singh Dinkar’s Poem “Veer” Dr Modi motivated the students to not to be scared by obstacles and hardships. With the examples from the life story of Dashrath Singh Manjhi, Arunima Sinha and Yuvraj Singh, he explained the students that due to their indomitable spirit, they created history and so as the students from JIVEM Schools may create history if they keep their spirit high and focus towards their target. Through his brilliant examples and presentation, Dr Modi drew the all round attention from the students. Towards the end of his Seminar, Dr Modi gave a minimum target of 90% + to the students and asked them to try hard to get selected for Unmesh Finale to be held in January 2018. In return, those brilliant minds promised Dr Modi to turn all his dreams and expectations into reality. Executive Director Mr Ashutosh Modi, Infrastructure and Planning Director Mr Akash Modi, Ms Garima Modi, Mr K R Dhinwa, Mr Mohan Lal Dhayal, Dr Ravi Shankar Sharma, Dr Snehlata Shekhawat were also present alongwith over 100 other staff members and officials. 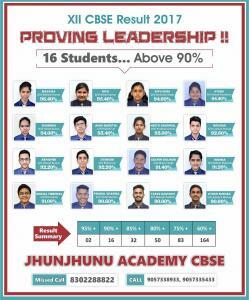 CBSE XII 2017 : Jhunjhunu Academy Outshines !!! Jhunjhunu Academy proved its metal once again in 12th results 2017 declared on 28 May, 2017. 16 learned scholars of school scored more than 90% marks. Malvika of 12th Science topped the list of the school by scoring unbeaten 96.40 percent while Ayushi Dhandharia topped the list in commerce stream by scoring 94.40%. Riya 95.40%, Ritu Dudi 94.60%, Shubhra 94.00%, Anuj Badetia 93.40%, Neetu Agarwal 93.00%, Rounak 92.60%, Abhishek 92.20%, Jitender 92.20%, Sachin Kulhari 91.40%, Rishika 91.20%, Kushal Tibrewal 91.00%, Prabal Sharma 90.60% and Ayush Mishra 90.00% added the brilliance in school result. In addition to this Tapas Dadhich of 12th FMM (Financial Market Management) topped the school by scoring 90.00%. It is yet another finest board result in Shekhawati Region, Says Principal Dr Ravi S Sharma. He stated that apart from 2 - 95.00% plus and 16 - 90.00 % plus, 32 students scored more than 85%, 50 students scored 80% plus, 83 students scored more than 75% and 164 student hit the First Division. While elaborating the qualitative performances of the students Dr Sharma iterated that Manish Kumar scored highest in Hindi 95%, Riya in English 93%, Malvika scored highest in Physics 98% and Biology 96%. Similarly Ritu Dudi topped in Chemistry with 96%. Ronak Khandelwal, Abhishek Katewa, Sachin Kulhari, Vipul, Neetu Agarwal, Prabal Sharma, Shwetang and Kushal Tibrewal scored highest 95% in Maths. In Commerce stream Ayushi Dhandharia , Ayush Mishra, Komal Dhedhia and Priyanshu Mittal scored highest in Accountancy with 95% marks and Business Studies is topped by Ayushi Dhandharia and Tushar Kumar by scoring 95% marks. Priyansh Kejriwal scored highest 96% in Economics. Tapas Dadhich of FMM topped in C.M.O. and D.M.O. by respectively scoring 93% & 90%. M.W.T. is topped by Ayushi Dhandharia by scoring 92% marks. Malvika in Music 98%, Khondram Borish Singh in Painting 99%, Shwetang in Physical Education 98%, Mayank Poonia and Abhishek Daila in History 85% and Mayank Poonia in Geography 93% scored highest. Dr Dilip Modi, Chairman JIVEM, Managing Director Mrs Nirja Modi, Mr Ashutosh Modi and Mr Akash Modi have expressed joy and congratulated the students on their success. It was their perseverance and faith in their teachers that led them to such brilliant success. The achievers have attributed their success to the valuable guidance and blessings of their parents and teachers. 250 selected Toppers of class X and XII from all JIVEM Schools and a galaxy of scholars glorified the Wisdom City campus on 13 September, 2016 on the occasion of Pre-Unmesh 2016 held at Navrang Kala Mandapam. 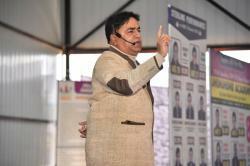 Dr Dilip Modi, Chairman, JIVEM was the Key-Speaker to this Life Lightening and an Eye-Opening Seminar. The main purpose of the seminar was to motivate the students to score high in their board examinations. In his ever charismatic style, Dr Modi verbalized the difference between Promotion and Selection. Through some compelling examples, he explained the importance of Goal Setting and the perfect ways to hit the target. The burning desire of getting succeed will only lead to the target, says Dr Modi. Depicting a poem of Shri Harivansh Rai Bachchan “ Koshish Karne Walon Ki Kabhi Haar Nahi Hoti” he gave a clarion call to the students to keep their burning desire alive and always strive to put every hard efforts in order to score 90+ in their exams. Adding an emotional quotient to his seminar he asked the students to pay due regards to their parents by performing extra-ordinarily in Board Exams. He illustrated several inspirational videos and stories to elaborate the importance of toil and moil. In a 6 Hrs Marathon Seminar, Dr Modi spoke on development of Concentration, Sitting Power and Memory. Through his brilliant examples and presentation, Dr Modi drew the all round attention from the students. Towards the end of his Seminar, Dr Modi gave a minimum target of 90% to the students and asked them to try hard to get selected for Unmesh Finale to be held in December 2016. In return, those brilliant minds promised Dr Modi to turn all his dreams and expectations into reality. Executive Director Mr Ashutosh Modi, Infrastructure and Planning Director Mr Akash Modi, Mr K R Dhinwa, Mr Mohan Lal Dhayal, Dr Snehlata Shekhawat, Ms Saroj Singh were also present alongwith over 100 other staff members and officials. Success Mantra by Dr Dilip Modi in Mini Unmesh 2015. 200 + selected toppers from various JIVEM Schools were invited to JIVEM School, Wisdom City on Sunday, Sept 20, 2015 to attend the motivational seminar Mini Unmesh 2015. 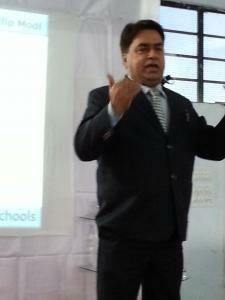 Dr Dilip Modi, Chairman, JIVEM Education was the key speaker. In his enthralling speech of more than 3 Hours Dr Modi gave Success Mantra to the students. Depicting the illustration from real life Dr Modi motivated the students to prepare for 100 percent and stop not till the target is achieved. He explained the difference between Selection and Promotion to the students and stated that in order to secure a place in Board Merit or to get selected in any competition exam one has to keep a burning desire in oneself. While discussing about the Goal Setting, Dr Modi emphasized on the motive of the Goal and asked the students to always compete with one hundred percent. Through a graphical representation Dr Modi illustrated the chart of quality study hours with the Ideal Time-Table of studies and explained the ways to improve memory, sitting power and concentration power. Adding the emotional quotient to his speech, Dr Modi gave a clarion call to the students to keep remember the dreams of their parents for them and work hard to hit the target, as there will be their parents only who would be rewarded with extreme happiness. It is worth mentioning that Mini Unmesh is an every year feature of JIVEM Education which is held to prepare the students for outstanding board results. Managing Director Ms Nirja Modi, Executive Director Mr Ashutosh Modi, Infrastructure and Planning Director Mr Akash Modi, Dr Ravi S Sharma, Mr K R Dhinwa, Mr Mohan Lal Dhayal, Dr Snehlata Shekhawat, Ms Saroj Singh were also present along with over 100 other staff members and officials from all JIVEM Schools. In return, the brilliant minds assured Dr Modi to turn all his dreams and expectations into reality. Wisdom city campus glorified on Sunday afternoon with the presence of over 400 students of class 10 and 12 who topped their last exam in different schools under JIVEM Education. The occasion was Mini Unmesh organized to motivate the students who are going to appear in Board exams this year. Dr Dilip Modi, Chairman at Jivem Education was the key speaker. In his speech of more than 3 hours, Dr Modi gave the success mantras to the students in his ever charismatic style. Through auto-suggestive success formulas, Dr Modi tried to make the students believe on their self capacities and capabilities in order to achieve their target. He gave a clarion call to every student to work hard and make a start towards infinity. Infra and planning director Mr Akash Modi, Host Principal Dr Ravi S Sharma, Mr K R Dhinw, Hostel superintendent were also present alongwith around 100 other staff members. In return, presented student promised Dr Modi to turn all his dreams and expectations into reality. Jhunjhunu Academy hosted one day Career Guidance Seminar keeping in view the interests of the students of 11th and 12th class. Purnima Foundation, Jaipur, organized this carrer guidance session. Dr. Neeraj, Mrs. Pratibha Sisodia and Mr. Sushil marked their presence as representative of the group. In career guidance session Mrs. Pratibha Sisodia, a world class counselor, addressed the students and said that for bright career “what to choose, how to choose and how to improvise the skills” matter a lot. Moreover, further in her address she spoke all about the formula to set the career. She said that adaptability, personality and ability play a vital role in a successful career building. Besides this a Robotics workshop was also held in which the students themselves operated the robots. 110 brilliant students and their parents from different JIVEM Schools glorified the Wisdom City Campus on 26th January on the occasion of UNMESH 2015, a motivational seminar held every year for the students who appear for Board Examinations. Dr Dilip Modi, an epitome of innovative ideas was the key speaker of the seminar. The theme of the seminar was ‘I Will’. Dr Modi spoke for more than two hours on the topic and motivated the students to score high in their upcoming board examinations. He inspired and encouraged the students making them realize their true potential. With the utter example of a Marble Stone and a God’s statue, Dr Modi asked the students to choose their path of life, whether they just want to remain a stone like marble or they want to be like God’s statue and get honored. Dr Modi expressed that in order to get honored, a student must has to sacrifice all his comfort and undergo through a hard and rigorous life style. He illustrated several inspirational songs and videos to multiply the positive energy among the students. He spoke on the importance of every one fourth of marks and asked the students to prepare for not less than 100 percent. Dr Modi also gave some useful tips through 10 Auto Suggestion formulae to score maximum in their exams. While speaking with the parents Dr Modi advised them to provide a conducive study environment to their wards and keep a parental watch over the students with a positive mind set. It is worth mentioning that the researches, understandings, experience and devotion of Dr Modi in the field of education, have helped thousands of students to pave their path of success. After Dr Modi’s marathon speech, students and parents promised Dr Modi to make his dreams true. Managing Director, Mrs Nirja Modi, Infra & Planning Director, Mr Akash Modi, Dr Ravi Shankar Sharma, Mr Mohan Lal Dhayal, Mrs Saroj Singh, Mrs Sunita Mishra were also present there with over 100 other staff members. In nutshell, It was really an enthusiastic seminar altogether with tons of positive vibes among everybody present. 10th Class CBSE result proved to be a real lettered day for Jhunjhunu Academy when 32 of its diligent students Dheeraj Mund, Kohita, Manisha Shekhsaria, Monika Kaswan, Pratibha, Sanjay charan, Siddha Sharma, Vaibhav Katewa, Ajay Jangir, Anuj Bishnoi, ARun Shekhawat, Aayush Kotiyal, Deepak Kumar, Harshit SAini, Jitendra S Raghav, Khushboo Sharma, Nikhil Kaler, Nitesh Kumar, Paridhi Patodia, Pushpendra, Ravi Dhayal, Rishabh Agarwal, Ritul, Rohit Dadhich, Rohit Poonia, Sachin Jangir, Sandeep Sharma, Shiwani Agarwal, Saurabh Datika, Shubham Tibra, Tanya Sharma and Nandita Vats scored highest status (10 CGPA) in class 10th CBSE Result 2012. This spectacular result brought jubilation and exuctation to the parents and the staff of the academy. The victorious stars of the academy had never ending smiles on their sparkling faces. All these illuminating stars of the school were honoured by the Chairman Dr Dilip Modi, M D Mrs. Nirja Modi, E D Mr Ashutosh Modi, Director Play School, Mrs Ranu Modi and the Principal with staff members. Appreciating the tireless endeavors of the teachers, Principal Mr R S Sharma stated that the School has produced the BEST result in Shekhawati region. Mr Sharma also said that there’s long list of the students who have scored more than 9 CGPA. He congratulated all the students and the staff members.